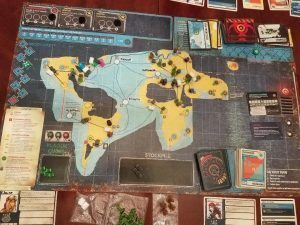 Pandemic Legacy 2: July & August. Fortunately we were able to win both July and August. Both of the games were near losses, but a win is a win! In both games we continued to use the same characters: Claire the Laborer/Architect, Aofie the Administrator/Runner, Goods the Farmer/Courier/Smuggler, and Newt the Radio Operator/Helmsman. In the beginning of July we found out that the satellite towers were picking up broadcast signals but we didn’t know who was transmitting them. It is thought that it is the Hollow Men but maybe it is someone giving the Hollow Men orders? It’s questioned if someone is ordering the Hollow Men to spread the plague. The journal entry talks about the grid growing and not being able to keep up with the Hollow Men. It also talks about preparing to forsake cities. June was challenging; we ended the game one away from death. To win the game we were able to build three supply centers and accomplish the new objective of making three broadcast towers in each area. When we completed the broadcast objective we learned that we picked up chatter from the Hollow Men. We found out they usually use the frequencies 9.2, 9.31, and 11.88. The hint also tells us when the towers are fully operational (predictably in August) we will be able to listen to their signals. We were able to make a road to connect London and Paris. We also connected Khartoum and LA to the grid to end the game. On the last play of the game Claire was to build a road from Atlanta to Mexico City and then build the last supply center. We were pumped we were going to end the game and we were on our 7th incident so one more plague cube was all it would take to end the game. When Claire tried to make her road from Atlanta to Mexico City she discovered she could not because it would be going over water. How did she not notice this?! Luckily, she was able to make it to LA and still end the game. That was a close one. 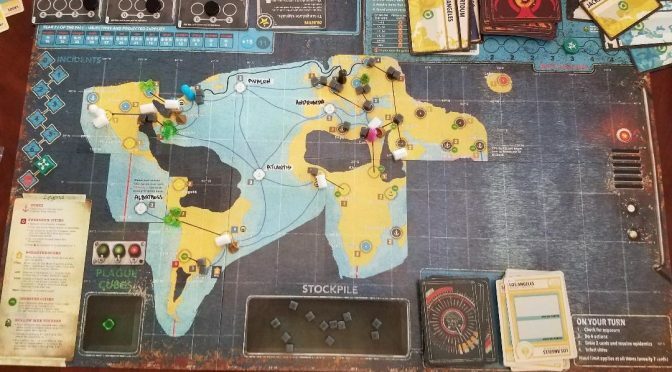 We used our game end upgrades to up the population in Chicago, Lima, Jacksonville, and Frankfurt. We used our last points to give Newt the Coordinator upgrade. The Coordinator is able to as a free action move a player to his location if the player is in an adjacent location. Onto August! Our journal entry in August informed us that the satellite towers were functioning and accessing different frequencies. This gave us the ability to use a Frequency Scanner. The Frequency Scanner is used when the player does the Monitor action. Monitoring is done by drawing and discarding 4 player cards while at a broadcast tower. Once this is done the player then scratches off a box on the frequency scanner. We were able to do this once in August but it did not yield any answers. At the beginning of the game we were also able to use 3 production points to give a player an upgrade. We gave the Supplier upgrade to Claire. This allows her to move a supply cube from the stockpile to a city matching a card in her hand. She can only do it once per turn as an action and she doesn’t have to discard the card. August started off badly. Right off the bat Atlanta, New York, and Baghdad were getting plague cubes. We had to take care of this quickly by adding more supply cubes there. We also decided it was best for Newt to use the Unrationed Event called Strategic Reserves. This allowed us to move 8 supply cubes from the reserve to the stockpile to use in the game. Unfortunately we cannot use this again but it really helped us out in this game. 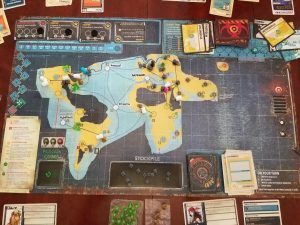 We were able to make the 3 supply centers, connect 2 new cities to the grid, and search twice to win the game. We connected San Francisco and Mexico City to the grid. Newt was able to search LA twice. When we searched LA by land we found shipping containers with supplies that allowed us to move 4 supply cubes from the reserve to the stockpile. When we searched by sea we found that we learned the location of a lost haven, but we had not accessed it yet. This allowed us to open box 60, but we already had so we gained an action. We won the game but had a hard time deciding what to do with our points. It was a hard decision because Khartoum became Forsaken and we were trying to decide if we should use the points to upgrade the population. Ultimately we decided to let Khartoum stay forsaken and we increased the population in Mexico City, Jacksonville, and Atlanta. We used our last 3 points to keep the supply center in LA. Can’t wait for September!